For over 25 years, All Canadian Coal-Fired Heaters have been meeting the heating demands of cost-conscious customers across Canada. Since 1990, the All Canadian Heater has been continuously updated and improved making it one of the most automated and efficient coal and pelletized bio-fuel burning heaters on the market today. With years of coal expertise, All Canadian Heaters have developed a reputation for quality workmanship and unparalleled customer support. Many satisfied customers have made the conversion to coal. The All Canadian Heater has worked with organizations like Alberta Innovates (formerly the Alberta Research Council) and Underwriters' Laboratories of Canada to develop new solid fuel technologies and to improve the safety and the environmental compatibility of the All Canadian Heater. To that end, the units are now UL listed in Canada and the United States to burn wood pellets (bio fuel) with the same dependable features developed over the years. The All Canadian Heater is listed (Canada and US) by the Underwriters' Laboratories. Each heater conforms to the rigid safety requirements of this internationally recognized regulatory organization and are built with only CSA certified components and boiler-grade material. The quality and workmanship of the All Canadian Coal-Fired Heater remains unsurpassed, as construction is performed by qualified and experienced Journeymen welders. I was very pleased with how easy the All-Canadian Heater was to install and operate. It has changed my perception of coal-burning appliances – no longer do I picture those plumes of black smoke. All-Canadian Heaters deliver a great product and provided tremendous customer support through-out the process of purchasing, installing and commissioning. We contacted All Canadian Heaters in the spring of 2015. We were looking at replacing our 10 year old, hi-tech boiler that was too complicated and unreliable. We met with All Canadian Heaters and discussed our requirements. 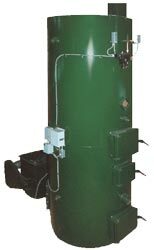 All Canadian Heaters designed a simple, reliable boiler to fit our existing space. We installed it in the fall of 2015 and have had no issues with it this winter. It just continues to run as expected. Trevor and Adele were well informed regarding the boiler, very accommodating and a pleasure to do business with. We bought our NAC40 in the summer of 2010. The boiler has worked without any issues ever since. We really like the simplicity of it, how well its build and it has been very reliable. We also save about 70% of our heating cost even with today's low gas prices. I would definitely recommend this boiler anyone who is looking to switch to burn coal. John Devries Devries Poultry Ltd. When my old boiler, which was 35 years old, started leaking, I decided to replace it. All Canadian Heaters built me a new one that fit perfectly. They even modified the location of the doors so it would fit into my location with easier access, as well as added extra ports for future use, all without hesitation. They produce a very high quality product, and they also are good people that will go the extra mile to make sure you are happy. Shaune S. Phantom Valley Farms Ltd. I have nothing bad to say about this system. We are heating a 6000 sq. ft. shop and 2 full size houses (1st is 800' and the 2nd house is 400' from the boiler.) Both houses have in-floor heating on all levels plus garages. I even have my sidewalks and patio deck heated (very little shovelling.) The other bonus is the snow melts off your vehicle twice as fast and the floor drys fast. We have been using coal for going on 12 years now and never had any major issues with the boiler. Yes it's a major expense off the get go but it's paid for itself within 2 years. It burns clean and almost odour-less coming outta' the pipe. We even had the gas company ask us why we're not using the amount of gas compared to a normal residence when the weather has been super cold. Service over the phone is great for any questions and if parts are needed. They're very friendly in person. I highly recommend All Canadian Heaters to anyone. In 2004, our farm purchased a 710,000 BTU All Canadian coal heater in an effort to curb rising natural gas costs on our mixed farming operation. At that time, we used our boiler to not only heat 2 hog barns, 2 shops, and 2 homes with attached garages, but we were also able to use the boiler to efficiently and cost effectively dry grain in place in the bin. As you can imagine, our boiler has seen several hundred tons of coal, yet it hasn't missed a beat. We attribute this to one of the first things we noticed about All Canadian when we were researching coal heaters, and that was their quality and craftsmanship. Those two factors have proven to be a great investment for our farm that are still paying dividends 12 years later. I would highly recommend this company to anyone considering alternative heat, the quality is unmatched, and the people are great to deal with! You get what you pay for when it comes to coal boilers. I had a cheaper brand before and it didn't last. I have been running the All Canadian for about 8 years now trouble free. Do yourself a favour, do it right the first time!